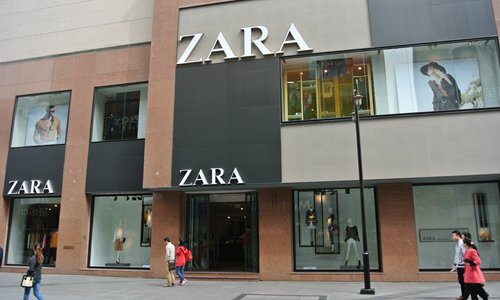 Spanish fast-fashion brand Zara denied defaming Asian women amid a flood of accusations from Chinese netizens after the company launched a new advertisement for its makeup line. The promotional pictures for the new lipstick collections, released on Zara's Sina Weibo page on Friday, feature Chinese model Li Jingwen with her iconic freckled face, which has sparked controversy on Chinese social media. Some netizens slammed the advertisement, saying that "such pictures featuring an Asian model with freckles and an expressionless pie-shaped face mislead Westerners' impressions about Asian women and can lead to racism against Asian women." The new makeup line is available on Zara's website worldwide and not aimed at the Chinese market, the company's customer service told the Global Times on Sunday. As the topic trended, Zara responded to Pear Video that the photos were taken in a natural state without any final touch-ups and were never intended to insult Asian women. The model was selected by Zara's headquarters in Spain, where aesthetics differ from Chinese tastes, said Zara. While some people slammed the advertisement, there were many other voices online noting that the photos were authentic and the public should be open to different aesthetics and be tolerant of real, imperfect faces rather than living in an edited beauty show. "Beauty or ugliness is not the only standard for models. Instead, faces that can leave audiences with a visual shock are welcomed in the modeling industry," an art blogger and well-known Sina Weibo user "Airan" told the Global Times on Sunday, noting she did not think Zara was racist against Asian women. The debate was due to cultural conflicts and different understandings of beauty, as most Chinese consider women with clean and glowing faces beautiful, while many Westerners admire natural faces without much cover-up, she said.